Chapters 5, 6 and 7 focussed on the teleoaffective structuration of child caring through practices of knowing the young child in distinct ways. This chapter turns to the moralities of child caring that connect the teleoaffective structure and the rules and principles of this practice, for whilst the teleoaffectivities of child caring point to why child caring is important, the principles and instructions map out how child caring ought to be done. As argued in Chapter 3, carrying a practice is always a moral and politically infused performance. This chapter moves through two interconnected arguments. I start by discussing a phenomenon I call the marketisation of child caring pedagogy, by drawing out a set of features of the ways in which information and instruction are evident in the business of child caring. Two of these features: pedagogic merging and the production of brand-company websites as a one-stop-shop are further explored. My concern is to develop an understanding of the marketisation of pedagogy so as to make the implications of this phenomenon clearer. 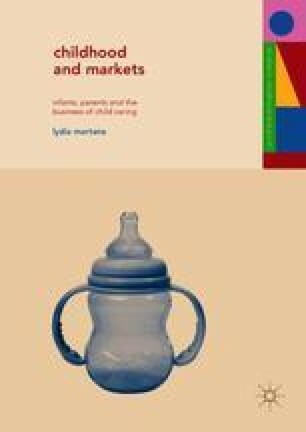 Following the argument in Chapter 3 that practices may be carried by different entities, I therefore focus primarily on the question what the process of pedagogic marketisation conveys about the position and positioning of commercial interests in the field of child caring. I then move onto the second part of the chapter, where, based on the semi-structured interviews with new and prospective parents, I present a three-fold typology of parental moral-selving (Barnett et al. 2005: 30). I conclude by thinking through how effective the marketisation of pedagogy is in governing new parent consumers in accordance with the principles of neo-liberalism. Afflerback, S., S.K. Carter, A.K. Anthony, and L. Grauerholz. 2013. Infant feeding consumerism in the age of intensive mothering and risk society. Journal of Consumer Culture. https://doi.org/10.1177/1469540513485271. Ellis, L. 2011. Towards a contemporary sociology of children and consumption. Durham theses, Durham University. Available at Durham E-Theses Online: http://etheses.dur.ac.uk/3206/.